Men's tees: While our t-shirts are preshrunk 100% cotton, you should expect up to 10% shrinkage for our original lighter weight, more fitted Next Level 3600 4.3oz When in doubt, we recommend ordering one size up. 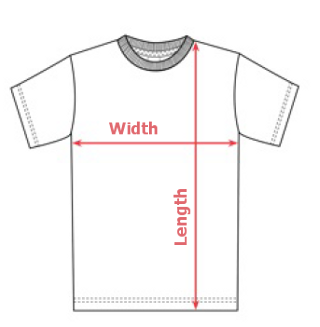 For our heavy duty full cut (slightly boxier with fuller sleeves) Hanes Beefy T 5180 6oz, you should expect ~5% shrinkage Read more about our tee blanks here. Long Sleeve t-shirts are Hanes 5186 100% ringspun cotton 6oz and should have shrinkage similar to our heavy duty Hanes 5180 short sleeve tee. Hoodies are a 50/50 cotton/poly blend so expect less shrinkage. Women's tees (Next Level 1510) and racerback tank tops (Next Level 1533) are 4 oz. 60% combed ringspun cotton/40% polyester lightweight jersey. Shrinkage is minimal after washing. NOTE: Sizing runs small for Women's tees and tank tops. Consider ordering a size larger. Width 15 ¾" 16 ¾" 17 ¾" 19 ¼" 20 ¾"
Length 25 7/8" 26 ½" 27 1/8" 27 ¾" 28 3/8"
Length 20 ½" 22" 23 ½" 24"
For pics of random car nuts in different size shirts, check our Awesome Fit Guide. Expect some small variability in the dimensions.